Before I go much further I will interrupt with a caveat… I’ve deducted one star from my five-star rating, because…ready for this… this is not a complete book in and of itself. This is part of a planned series. If you know my reviews, you’ll know I very much dislike books of a series in which you have to read the next book(s) to know the outcomes from this book. Sorry Ms. Grant. Sorry Orbit Books. A beginning, a middle, but no end? That’s not a complete book. That’s a cheesy way to get us to buy another. But what’s worse…you don’t need it. Mira Grant’s writing is such that we WILL read another, without the cliff-hangers or unanswered questions. In the future, a medic break-through will be engineered. Tapeworms will be coded in such a way that they will provide medical care for the worm’s host body. An infection? The worm takes care of it. Cuts and bruises? The worm takes care of it. Need medicine on a regular basis? The worm takes care of it. Sounds pretty awesome, right? Of course you have to agree to have a tapeworm implanted — that part seems more than just a little gross. But given the incredible potential benefits…it seems a fair trade. 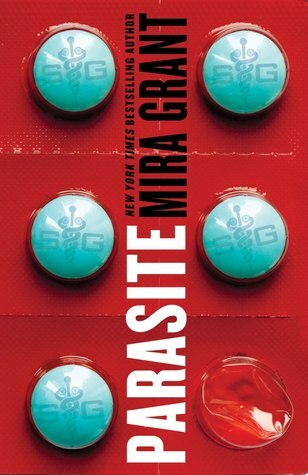 In Parasite, our primary character is Sally — a young woman who has taken the care of the parasitic tapeworm to the extreme… the worms seem to have brought Sally back from the dead, or at least portected her from what would have otherwise been a fatal car accident. Because of this unique situation, and because Sally has no memory of her life before the accident, the mega-corporation SymboGen, which has designed and sells the tapeworm, has taken a special interest in Sally. Sally, as she relearns everything in her life, and grows as a person, takes a disliking for SymboGen and it’s founder/creator/leader Dr. Banks. Sally’s parents treat Sally like the six year old that she is (mentally; emotionally) and are grateful for SymboGen’s care for their daughter, but also have concerns about SymboGen. About this same time, as Sally becomes aware and strong as a young woman, there are unusual cases of a ‘sleepwalking’ sickness, in which individuals very suddenly seem to lose all sense of humanity, become empty but violent. SymboGen wants to protect Sally, but as the sleepwalking sickness happens in their own ‘safe’ building, Sally looks elsewhere for help and protection. As the story progresses, Sally gets pulled in many directions, fed more and more information about the parasites and about the sleepwalking sickness. That the two are connected seems obvious, even to Sally, but how they are connected, is the mystery to keep the story going. What Mira Grant does well (among other things) is create a very believable world. There is the strong sense that this could truly happen, and not so far in to the future. There is also a sense that there is an entire world here…not just a back lot where this action takes place. Part of this is created by the quotes from books and interviews that Grant has created. There are also the characters who are not black and white, good or bad, but a mixture of strengths and weaknesses just as all of us are. Yet we know and detest the clear villian and put our trust in the heroic characters. This is quite a feat that Grant has managed. I was totally engrossed in this book and read the last half of the book in one sitting (which is quite a feat on my part)! I love that Grant has created a new take on the ‘zombie’ idea, especially after having done such a great job with her Newsflesh series (which I very much enjoyed). I look forward to the rest of this series. But please…how about a book…with a beginning and a middle and an end?! Looking for a good book? This is top-notch horror/sci-fi/speculative fiction. But be warned…it doesn’t end with this book.